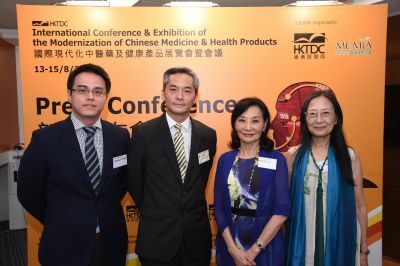 HONG KONG, Aug 6, 2015 - (ACN Newswire) - The latest Chinese medicine products, industry trends and technology will be spotlighted at the 14th edition of the International Conference & Exhibition of the Modernization of Chinese Medicine & Health Products (ICMCM), which runs from 13 to 15 August at the Hong Kong Convention and Exhibition Centre (HKCEC). Jointly organised by the Hong Kong Trade Development Council (HKTDC) and the Modernized Chinese Medicine International Association (MCMIA), the fair features more than 120 exhibitors from nine countries and regions. Among the event highlights is the two-day ICMCM Conference (13-14 August), under the theme "CM Research & Commercialization on Cardiovascular Diseases". The first two days of the ICMCM are exclusively for trade representatives while the final day (15 August) will be open to ticket-holders. At today's press conference, Johnny Wan, Director, Exhibitions Market Development, HKTDC, said: "The large number and wide variety of exhibitors at the ICMCM this year highlights the growth and diversification of the Traditional Chinese Medicine (TCM) industry. Hong Kong, with its East-meets-West culture and transparent regulatory environment, is the ideal place to showcase the attributes of TCM and introduce related brands, products and services to a global audience." This year's ICMCM provides a diverse showcase of the latest technologies and brands related to TCM, including health foods, health care monitoring devices and anti-ageing products. Exhibitors are coming from the Chinese mainland, France, Hong Kong, Japan, Korea, Macau, Singapore, Taiwan and the United States. There will also be Group Pavilions from the mainland representing Gansu, Guangzhou, Jilin, Guizhou, Qinghai, Zhuhai and State Administration of Traditional Chinese Medicine. To enhance the experience of fair visitors and facilitate product sourcing, there will be eight exhibition zones at the fairground, namely; Beauty & Fitness, Chinese Medicine, Functional Food and Products, Health Supplement, Health Care & Therapy, Research & Development, Raw Materials, and Equipment & Related Services. A premier international event for the Chinese medicine community, the ICMCM Conference (13-14 August) keeps practitioners abreast of the latest trends and developments. This year's 12th edition of the ICMCM Conference adopts the theme of "CM Research & Commercialization on Cardiovascular Diseases". It will feature high-profile speakers from Germany, the United States, the Chinese mainland, and Hong Kong. Conference sessions will focus on such topics as cardiovascular tonic herbs, data-mining for coronary heart disease and markets and drug quality. Other knowledge-sharing events include a Seminar on Testing and Certification of Chinese Medicines on 14 August. Meanwhile the 11th International Postgraduate Symposium on Chinese Medicine, which will also be held on 14 August, is co-organised by the University of Hong Kong. On the last day of the ICMCM (15 August), the fair will be open to public ticket-holders, providing visitors with updated information on TCM and giving them a chance to learn more about products on the market. Events organised for the public include a Chinese Medicine Health Public Forum. Practitioners will also be on hand to discuss ways to apply Chinese medicine in everyday life. Hong Kong is a leading international hub for TCM. In 2014, Hong Kong's total exports of Chinese medicines amounted to US$452 million, a 9.3 per cent increase year-on-year. Hong Kong's top export markets are the Chinese mainland, Macau, Taiwan, Indonesia and the US. The ICMCM is among four international fairs being staged concurrently by the HKTDC at the HKCEC. The other fairs are the HKTDC Food Expo and the HKTDC Home Delights Expo which run through 13-17 August, while the HKTDC International Tea Fair will be held from 13 to 15 August. Together, these events represent unique business and networking opportunities for trade visitors, while also giving the public a chance to explore new experiences in the respective categories.